Posted on April 24, 2015 April 28, 2015 . by Patrick Johnstone. 1 Comment. For those who were paying attention, the City of New Westminster’s new 5-year Financial Plan just went through public hearing, and passed three readings at Council. After months of work, several reviews by Council, and a not-terribly-exciting public engagement process, the Bylaw that supports the Plan will likely be adopted by Council this Monday. But we really haven’t talked about it as a community. When you measure column inches in the local paper, hours of council delegation time and discussion, or conversation at coffee shops and pubs, Parkades and Lancers have by far outstripped this. Which is probably not good, as this is arguably the most important thing Council ever does – scheduling the spending of your money. We, as a City, need to have a better conversation about this, and I hope the Mayor’s Public Engagement Taskforce can figure out how to make this issue front and centre in the City’s conversation for the next budget cycle. It’s not like people in New Westminster don’t talk about taxes. It comes up every local election, and there will be a few letters to the editor complaining about the increase approved this time around. There was even a Facebook page that *mysteriously* popped up during the last election all about the untenable tax situation in New West. 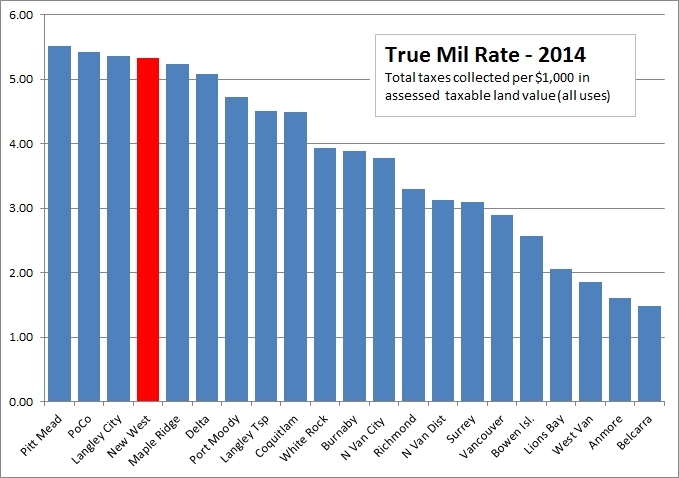 The general opinion is that New Westminster is either one of the highest-taxed communities in the Lower Mainland, or the highest. This spectrum of opinions is only partially true. 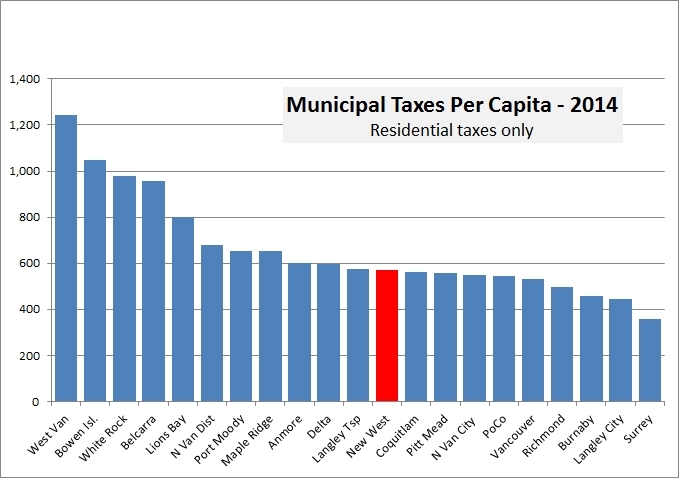 A few years ago (long before Council was a glimmer in my eye) I wrote a series of blog posts on taxes in the City compared to the rest of the region. I wanted to understand where we stand and wanted to cut through the rhetoric. I talked about what a mil rate really is, I expanded by talking about how that compares to actual taxes you pay based on typical house values, and for the fun of it, threw utilities into the mix. My conclusion at the time was that we were not the highest-taxed community in Metro Vancouver, but somewhere in the middle. As a general rule, people north and west of us paid more, people south and east paid less. Now I have a new role, and although I do not agree with the opinion that taxes are “out of control” (as people continue to ask for the services that taxes provide), I do think I need to be more cognizant of how the tax system in the City relates to other municipalities with whom we compete for businesses and residents (with taxes being only one of the many factors that influence location choices for both of those). So I started to gather data on taxes from various Cities’ 5-year Financial Plans. However, if you start to search through them, you quickly realize the varying ways financial statements are presented in the published plans. For fun, compare recent 5-year plans of Burnaby and Port Moody. Fortunately, local governments are required to make disclosures to the provincial government every year, and through that process, a standardized set to statistics are collected. You can read them here. I’m not saying they are the perfect Stats to evaluate whether we get full value for our taxes, but it does give us a level playing field through which to compare New Westminster to our neighboring jurisdictions. And comparison, I will do. 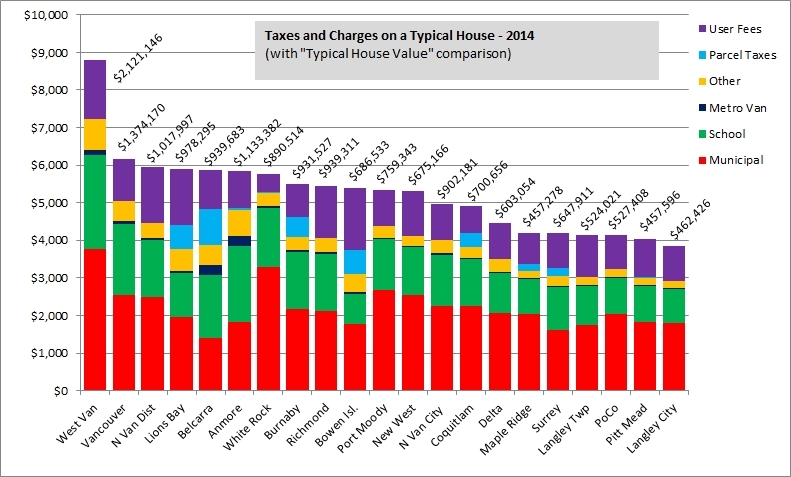 This first graph below shows what a typical household should have paid in all property taxes to their municipality in 2014, and breaks it up by different categories. The number on the top of each column is the assessed home value deemed “typical” for that community by the province, and the value used to calculate the tax amounts based on mil rates. Note that municipalities with low land values cluster towards the left side of the graph, and higher-land-value places cluster towards the right, so this graph more displays relative land value than it does level of service provided or efficiency of the operation of local government. Up to now, we have only been looking at taxes as compared to land value. Land doesn’t pay tax, people do. 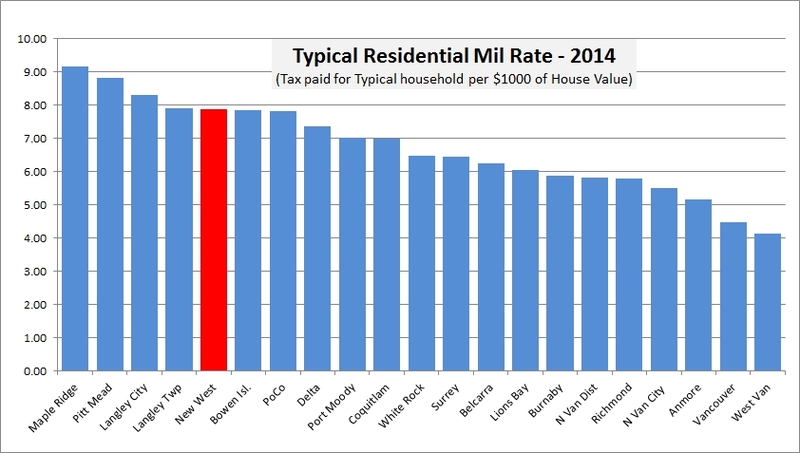 So it might be more meaningful to look at how much tax we pay per resident in the City. Lucky, the same provincial data provides population estimates by municipality projected from the 2011 census to 2014, so that is also an easy comparison to make. Here, again, New Westminster is up in the top quarter, finishing 5th of 21 municipalities. I say coincidentally because although New West finishes 12th in the first and last graph here, none of the other 21 municipalities fall in the same location on both graphs. There are many ways to look at the numbers, but by various apropos analysis, New Westminster residential property taxes are pretty much in the middle regionally. Our $572 per person in 2014 puts New Westminster well below the $660 regional average, and essentially equal to the regional median of $573 represented by Langley Township. So why do some graphs show New West so high? That has to do with how we use our land in New West, and how we tax residents, businesses and industry differently. To see more analysis of that, you will have to stay tuned for Part 2, coming soon. Posted on April 22, 2015 . by Patrick Johnstone. 1 Comment. When is the Café/Restaurant at the Anvil Coming? Is there an issue with the contract demanding Fair Living Wage? Using CUPE staff to overcome this issue like done at Pier Park concession, needs to be discussed. This was sent as a comment on a recent Council Report, but I thought it worked better as an ASK PAT, and hey, it’s my party, so I can post how I want to. There are some things I simply cannot talk about on this forum, because of Section 90 of the Community Charter. However, I am confident that we will soon have a tenant operating a restaurant in the Anvil. The Living Wage Policy is not an issue. You can read the policy here, and see that it only applies to organizations providing services “to the City on City Premises.” As is a practice I try to use here, the “City” with a capital “C” strictly means the corporate entity, not the general populace (“community”) or geographic locality (“city”). Companies that lease property from the City to operate a not-for-profit or for-profit business venture in the city that offers goods or services to the community are exempt from the policy. Ask Pat: bike lanes on bridges. Posted on April 20, 2015 . by Patrick Johnstone. Leave a comment. My bike commute has got me thinking lately…thinking about bike lane design on bridges. I’ve had some close calls on the Queensborough Bridge with cigarette-wielding, headphone wearing pedestrians travelling in the same direction, totally oblivious to their surroundings. I also had an accident on the same bridge while passing a fellow cyclist who urged me to go around him. And I’ve never understood the unwritten rules of passing etiquette on the Pattullo Bridge (“I’ll stop if going up” or is it “I’ll stop if on the inside”, or maybe it’s just a game of chicken). So, what is the best design of cyclist/pedestrian shared pathways on bridges? Is bigger better? Is there a secret formula for success? New West will soon have two new shared bridge pathways: the new Pattullo and the drawbridge from the Quay to Queensborough. I am curious if these will be built to ensure a pleasurable experience for all. I feel qualified to answer this, because the Queensborough is on my regular commute, and indeed, a little sidewalk etiquette would be in order. The only real conflict I have ever had was with a defensive dude on one of those electric fake-mopeds which I ranted about previously. 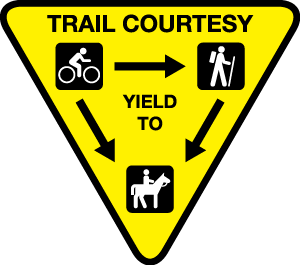 However, I am commonly bothered by two things: inattentive pedestrians with earphones that are impossible to pass, no matter how much you ring a bell, slow down, say “ahem” or “excuse me”; and downhill-travelling cyclists who have a distorted trust in our combined ability to prevent collision as they blow by me at high speed. A second suggestion would be the old skiing standard that lower traffic always has right-of way. Meaning if you are going downhill and approaching someone else also going downhill, you slow down and only pass if they wave you through. If you are going downhill and someone is coming uphill, the person going down always yields (makes sense as it takes more energy to stop and start while climbing than it does while downhilling). That would deal with 80% of conflict, common courtesy with another 15%, and the last 5% are jerks you just gotta put out of your mind – there’s no helping them. At least you only have to deal with them 5% of the time. Imagine how hard it must be for them being jerks 100% of the time! The new Q2Q bridge is initially being designed to accommodate a police vehicle or ambulance in the event of emergency, so I am pretty sure it will be wide enough to be comfortable (like the Canada Line Bridge). Initial design of the eventual Pattullo Replacement hasn’t even started, to my knowledge, but considering the Canada Line Bridge is the last piece of water-crossing cyclist and pedestrian infrastructure that TransLink has designed and built, I hope for as high a standard. Posted on April 19, 2015 . by Patrick Johnstone. 3 Comments. This was quite the meeting. We had a relatively light agenda, but there was an annual special event where Elementary students are awarded by Council (with generous sponsorships from several Architecture Firms and other businesses in town) for their winning Heritage Poster Contest entries. We had presentations from the Labour Council on workplace safety (with continued depressing stats about worker deaths in British Columbia) and the Arts Council (an organization that is going through some exciting changes right now). We also had a presentation from the Mayor and CAO about a future vision for Sapperton as Royal Columbian Hospital sees expansion (this is something people should be paying attention to, as it could be a significant re-shaping of our City). Then we had more than 2 hours of delegations on two topics. The Parkade issue is one I have already discussed at length, and as the delegations really brought nothing new to the table, I have little to add to my earlier comments. The Lancers issue is something I have not written about. Actually, that is not true, I have sat down and written quite a bit on the topic, but cannot find a way to write my feelings and opinions without risking throwing more fuel onto the fire, so I have not posted those writings. Instead, I have been having conversations in the community, with people in strong support of the Lancers, and with those who wonder what all the fuss is about. I always found those discussions circling back to two terms: “tradition” and “patriarchy”, and those discussions have been thoughtful and respectful. So I am going to put the on-line discussion aside for now, and may write something more after next meeting, where Council will be discussing the Lancers. What I didn’t mention was that we had our annual Parcel Tax Roll at 6:45. This is when we formally review and approve the list of properties that are voluntarily part of a Parcel Tax. These are generally BIA members who have allowed the City to collect the BIA fee on their behalf, and residents in areas where a special local tax was applied to pay for a local amenity, such as enclosing a ditch in Queensborough. One of our committee members has moved out of town for job reasons, so we went back to the original applicants and found a promising replacement! We also had an applicant for the vacant “representative from a local business”. I co-chair this committee with Councillor McEvoy, and we will be seeing good things come out of it this year, I hope! This was another committee with two Council co-chairs, and one of the Councilors ended up having an unmanageable timing conflict, so this committee is back down to one Council representative. The regional emergency communications organization (E-Comm) has a board of directors which includes representatives from Local Government. Councillor Trentadue was nominated by our Council to be one of those representatives. This amendment to how the City does public delegations was recommended to Council by staff, specifically by the City Clerk. To understand the change, it is helpful to understand the role of the City Clerk, and the law around Public Hearings. Amongst other jobs, the City Clerk is responsible for assuring that Council does things legally. Provincial Legislation gives relatively broad guidance about how a Council runs meetings, but at times the rules are very strict. For example, when Council discusses things in camera it is on the recommendation of the City Clerk and her understanding of Section 90 of the Community Charter that requires us to have those conversations in camera, and actually limits our ability to speak about those deliberations. Public Hearings are a required aspect of many types of Bylaw changes, including Rezoning. Appropriate notice of must be given of that Public Hearing, and Council is not supposed to take any kind of position on the topic prior to the Public Hearing. Of course, that is a rather silly game we play saying we have a completely “open mind” and no opinions prior to the Public Hearing (if there is one thing politicians have an excess of, it is opinions). However, there is clear intent in the law that Council members should not prejudice the process prior to a full Public Hearing. Staff were concerned that the open delegation process we have at New Westminster Council, where anyone can come to a Council Meeting and take 5 minutes to talk about anything that concerns them, created a challenge at protection of the Public Hearing process. A small but vocal group could overwhelm the public conversation about a project headed to Public Hearing, and potentially derail the ability to provide a project (or, for that matter, those opposed to a project) a fair hearing. The way this Bylaw change is drafted, no delegations would be permitted once the date of the Public Hearing has been announced. To put that in perspective, most development projects will come to Council once or twice, see committee review, and go to public consultation (open houses, Residents Associations, etc. ), and be publically “in the pipeline” for a year or more before we get to the point that a Public Hearing is scheduled. The Hearing is usually scheduled when the final report is received from City Staff which summarizes the project, as adapted (or not) by public engagement, committee review, and the long push-pull between developers and staff as the project is compared to various City policies and bylaws. A Public Hearing is usually scheduled one to three weeks after that final report is received, and a special day is set aside such that people cannot delegate on other topics on that date..
During the entire year-or-longer process, people and groups can delegate to Council on any aspect of the Project. However, once the Public hearing date is set, there will be a one- to three-week window when no delegations will be permitted. You can write letters to Council (yes we read them), you can write Letters to the Editor, write a blog post or tweet to your hearts content. You can call us on the phone or corner us in a coffee shop (yes, we are that small a town!). However, if you want to provide a public presentation to Council on that topic, you need to save it for the Public Hearing. We referred this amendment to Council for three readings. This proposal is for an Official Community Plan amendment and a Heritage Restoration Agreement to permit the building of a second structure at adjacent to Robson Manor at 101 Third Street which will allow this local private school to realize expansion plans from about 150 students today to about 450 students by 2022. I have received more correspondence about this project in my short time on Council than any other topic, and I can safely say the community is divided over this project. I have continued to learn about the process, the project, and the pros and cons. In Council today, we did not approve or oppose the project; we agreed to allow the process to continue forward to Public Hearing, which will be held on May 4, 2015, and I expect it to be a long one. C’mon out and tell us what you think. This is a Heritage Revitalization Agreement that lapsed due to a short timeframe allowed in the original Bylaw, and staff underestimating the time it would take to get through the procedure of subdividing the Lot. We need an amendment here to extend the deadline. No conditions have changed, we have just given the City and proponent a bit more time. Heat Pumps can be super-efficient ways of heating a modern house. They are becoming more common as people seek to reduce energy prices, to use electricity instead of fossil fuels, and to get both heating in the winter and cooling the summer from the same unit. Air-to-air heat pumps are basically air conditioners in that they move heat by compressing air and taking advantage of the Ideal Gas Law (my favourite gas law, because it rhymes: PV=nRT! ), and they can move that heat into our outside of your building, depending on the season. The only down side is that they contain a bunch of mechanical devices (compressor, condenser, pumps and fans) in a tight space and can sometimes be noisy. Installing one on the side of your house might put it right under your neighbour’s bedroom window, and they don’t want to hear it pumping away all night. The City is currently limited in their ability to enforce noise bylaws around heat pumps, and the ways a homeowner can address a heat pump that disturbs their neighbor are sometimes unreliable or expensive long after the unit is installed. Best if we address the problem when the heat pump is installed, as other cities have done. Council authorized Staff to go ahead and start researching and drafting a Bylaw to address this issue. Properties that receive a Heritage Revitalization Agreement are, by policy, added to the Local Register, which is what we are doing here for Dontenwill Hall, The MacKenzie Residence on Cumberland, and the Shymkovich Residence on Ewen. Meanwhile, the Royal City Glass building on Carnarvon has not retained much of its heritage character, so it was removed from the Register. And the Hansen/Emery Residence had an address change (it didn’t move, the roads did). Glad we got that all cleared up. This is an unopened portion of the Boyne Street alignment in Queensborough that will never actually become a road because of the way development around it has been organized. But to close the road and sell the land, we need to pass a bylaw and have a public hearing. We will hear from the public on April 27. C’mon out and tell us what you think! For lack of a better term, this is the City Budget. Provincial legislation requires that local governments have a 5-year plan that is updated annually. You can read the Financial Plan here, and I will write in future posts about taxes in the City, because there is are some strange ideas out there about how New West measures up when it comes to Property Taxes. We had one (1) person delegate to council about the Five-year Financial Plan, which should send some sort of message, but I’m not sure what it is! In the short term, we have moved the Bylaw that adopts the Plan for three readings. There was a correspondence we acted on from the City of Richmond. I removed myself from this discussion, not because I had a fiduciary interest or this in any way interferes with my ability to do my job in Richmond or remain impartial at New Westminster Council, but because Richmond is my employer, there may be some perception of conflict, so better to step out and avoid that perception. We received a Report for Information about the operational budget for the Anvil Centre. We are early on in operation of the Anvil (2015 will be the first full year of operation), and this is a facility with multiple overlapping purposes, which makes integrating them an interesting challenge. The Convention Centre portion of the operation is doing very, very well. They are booking ahead of expectations and are receiving kudos regionally as a place for conferences medium to small, weddings small to large, and meetings of every shape. The Media Gallery, Hall of Fame, Museum, and Art display spaces are things that will not generate as much revenue, although they are a major part of the attractiveness of the facility overall and dovetail nicely into the Conference Centre operation. On the other side is the new home of the City Archives, which is not a revenue-generator, but is an important part of the operation of a City as historic as New Westminster. The part we are still ramping up and need to make successful if we are going to call the Anvil Centre a success are the public use spaces: the dance studio, arts spaces, meeting rooms and classrooms. These are the parts of the Anvil that the City will always subsidize, for the same reason that we currently subsidize use of the Canada Games Pool and Queens Park Arena and other City amenities. I hope that in 10 years, we see the types of talents being developed in the Anvil Centre towards the arts being as valued in our community as the types of talents being developed at Canada Games Pool or Queens Pak Arena towards athletics. I discussed this previously, and it was formally Adopted. It is now the Law of the Land. As discussed above, this saw three readings. As discussed above, these saw two readings, and will go to Public Hearing on May 4, 2015. C’mon out and tell us what you think. And that, after a Notice of Motion and Announcement on the Blue Dot Movement, at some time just short of midnight, was a Council meeting. Posted on April 18, 2015 . by Patrick Johnstone. Leave a comment. Yes, I have been a little slow on updates here, but it has been a busy time. I actually had to send my Mom an e-mail, as updates here are the only sign she usually gets that I am alive. I will try to get my update of last week’s Council Meeting before next week. Fortunately, we don’t have an evening meeting next week so that will hopefully help me get caught up! In the meantime, I had a great day today down at the River Market, enjoying the last “winter season” Farmers Market of the year in decidedly non-wintery t-shirt weather, while talking to people about the Transportation and Transit Plebiscite, and reminding those who have not yet received their ballots how to make sure they get one (short version – go to the ElectionsBC website, or call 1-800-661-8683. No salesman will visit your home!). 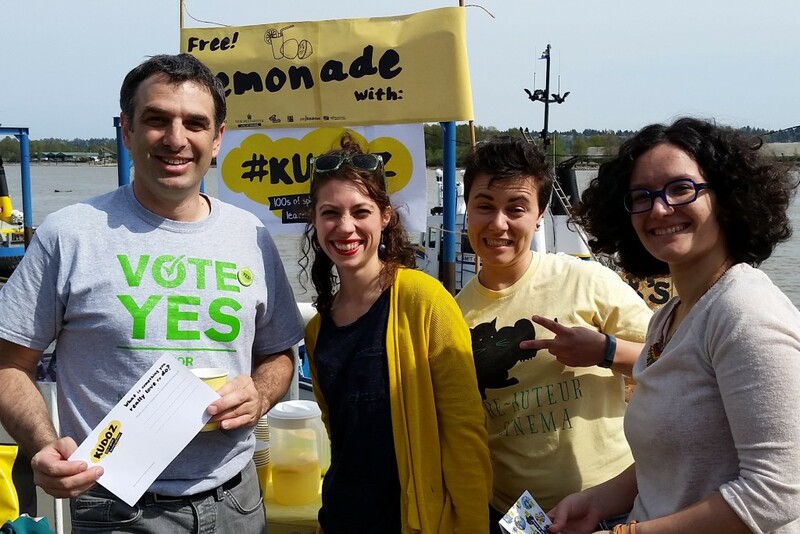 While I was there, I also got to fill in my “Experience Card” for a great new organization in the Lower Mainland called “Kudoz”. The idea is to link people in a variety of work, volunteer, or hobby fields with a person with a traditional work barrier or disability, and give that person a learning experience, and see if that experience piques an interest in further learning. I’m not sure if any of their applicants think local government or committee work is interesting, but I’ll do my best to make it seem that way! Have an hour a month to share with someone, teaching them something while you do whatever it is you do? Send Kudoz an e-mail. They had great free lemonade, and it was definitely a free lemonade kind of day. Posted on April 12, 2015 . by Patrick Johnstone. Leave a comment. A vision for the future of the Region, based on how we built the region we all seem to love so much. On hating the process, but finding a way to make it positive. On working with our regional neighbours to solve our unique local traffic problems. On supporting a regional Plan, and asking why we can’t have nice things like Ontario? Ahh… just go to my archives and search under “transportation”, there are more than 200 posts, all talking about the regional and local transportation mix, and solutions that need ot be found locally and regionally. A No vote provides no solutions, solves no problems, and makes no promise moving forward. I like solutions, I like regional collaboration, I like good public policy. The YES vote is obvious. Posted on April 5, 2015 . by Patrick Johnstone. Leave a comment. Hey Pat, read your save the parkade post. Agree with all your points, but my main concern is the possible increase in noise since we will be removing a barrier to it. Is the city doing anything to mitigate this possible impact as a result of demolishing the west half of the parkade? Hi Someone (if that’s your real name!) Sorry to be so late answering. Busy times. I have heard several opinions about the effect of the Parkade removal as far as noise goes, but there are several stories to be told in regards to the noise. When it comes to trucks, most of the noise is generated low down in the engine and (in the case of container trucks) the undercarriage. For trains, you have shunting noises and the whistles (and general wheel squeak). Each need to be addressed differently. The City is currently looking at how the Front Street Mews will be developed, and there is every possibility that a low-level noise barrier that addresses most truck noise will be part of that plan. Improving the pavement and aligning the road better will also help this. The train noise is currently aside the Parkade, not below it, although the Parkade probably acts as a bit of a barrier to a few residential buildings in the Downtown. The City’s Whistle Cessation Strategy will hopefully see the end to whistles along that stretch of the rail tracks in the next year or two – but that requires that the crossings are made safer, which removal of the Parkade will assist with. There is no doubt that the noise level at ground level of Front Street can me significantly improved for very little investment, once the Parkade is gone. Both of these, however, need to be put into context of the longer-term vision for the City’ waterfront. Ultimately, Front Street will not be a regional truck route, but will be a local road serving the needs of New Westminster. There has also been some discussion about the long-term fate of the rails (of which I have a pretty strong opinion). We are not there yet, but long-term visions need a starting step, and investing in another 20 years of the west half of the Parkade is a step in the wrong direction – good money after bad. Posted on April 3, 2015 April 3, 2015 . by Patrick Johnstone. Leave a comment. As with most end-of-the-month meetings, there was a Public Hearing as part of the March 30 Council Meeting. On these nights, we start a little early (well, we start at noon most days, but the evening portion starts early) to give people a change to provide input to items that are required to go to Public Hearing prior to Council decision. Tonight there were a few topics, one which attracted several speakers. These two complimentary Bylaws allow the re-purposing of Dontenwill Hall at 336 Agnes Street, to convert its use from “Public Assembly” to “Church”, and to make some improvements to the historically important building. At Council, we were able to see reports by the City’s Heritage Commission (in support) and the Advisory Planning commission (in support, with some comments). We were also told that the non-compliance in regards to on-site parking were a concern to the City’s Engineering staff, regardless of the parking study provided on behalf of the Proponent. The Open House feedback was minor, but positive, and the single piece of correspondence we received was opposed. We heard a delegation from the architect who did the heritage assessment, and from a leader at the church. We also heard several delegations from a couple of concerned neighbours and one adjacent church about the parking situation at the site. Frankly, parking around the property is the one issue that might have derailed this plan. However, there was simply no location on the property to accommodate parking – any future development of this site that provided the required parking would result in razing of the historic building, or no redevelopment would likely result in the loss of the building through neglect. Through the delegation process I heard that this was a small congregation, and there were no less than 5 other churches in the immediate area, most of which provided little or off-site parking (the Emmanuel Pentecostal being the exception – they built an underground parking lot in a residential development adjacent to their church to accommodate many of their parishioners). In our compact, transit-oriented downtown, if we want to save our heritage structures (most built without parking) we are going to have to allow these types of exceptions. In the end, I supported this HRA and repurposing of the hall. I hope they can work with their neighboring churches to find creative solutions to Sunday Morning Parking Crunch. This Bylaw limits the number of plumbing fixtures in Accessory Buildings. The issue staff is trying to manage here is the illegal conversion of accessory buildings to living spaces. Our RS-1 zoning allows for a single accessory building, up to 10% of the lot coverage, which for many lots in the City means a 500+ square foot building. Meant to be a garage, storage shed or hobby shop, people are converting them into “mortgage helpers” and renting them out. There are a few reasons we want to avoid this. It isn’t fair to people with legal secondary suites who pay for that privilege (through extra utility charges, mostly) or to people without secondary suites (who shouldn’t have to subsidize the extra suite of their neighbour) if people start renting out their garages. Accessory buildings also do not have many of the building code requirements for dwellings, meaning they can be firetraps, have mold problems, or otherwise be unsafe. One way to prevent these conversions is to simply make them harder to do at the time the accessory building is built and the Building Inspector is signing off. Recently, the City has seen plans come in for “Accessory Buildings” with a hookup for a furnace, a laundry, and a full bathroom, all strategically placed so that setting up a full kitchen would be simple – the builders aren’t even being subtle about it. This Bylaw hopes to give staff the tools they need to say “um, no.” It will not make conversion to illegal suites impossible; it will make them more difficult. The issue of secondary suites and laneway housing is an important one in the City right now, and has been prominent in the discussions around the new OCP. This Bylaw will not prevent future development of Laneway Housing, but it will slow the building of illegal ones until the OCP is updated, and we can get a handle on how nieghbourhoods want to accommodate (or not) laneway housing. In the end, I supported this Bylaw, as I want to give staff the tools they need to do their jobs. Turning a blind eye to illegal conversions of accessory buildings is not a good idea. After the Public Hearing, we launched into our Regular Council Meeting. As is typical on Public Hearing nights, there were no Public Delegations permitted this evening. What we did have instead was an Opportunity to be Heard on the City’s 5-year Financial Plan, right at the start of the meeting. I am going to have to write in more detail about the Financial Plan for the City. If I start here, I am going to fill this entire blog post, so I will put it off for a later post except for a short summary. Currently, we have a $111 Million budget, and have a proposed tax increase of 2.42%. For a typical single family home, that means you will pay $62 more in Property Taxes this year. And despite what some may tell you, that keeps us squarely in the middle regionally as far as property tax levels. 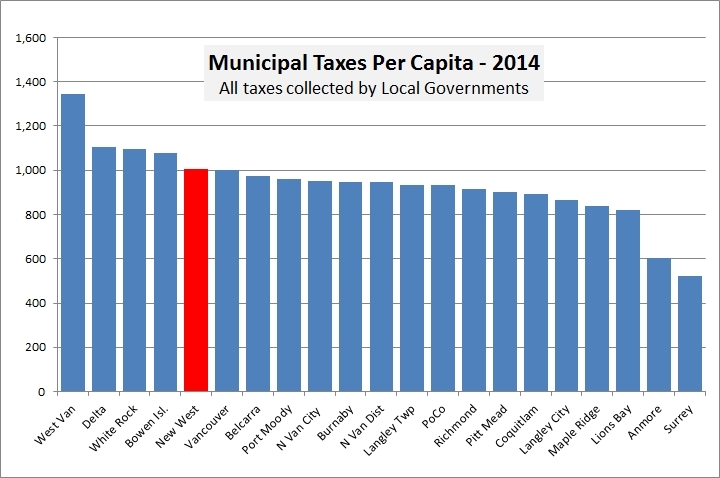 As I once explained at length, Cities in the Lower Mainland to the north and west of us pay more taxes, Cities to the south and east generally pay less. The bigger news, however, is that all of your utility rates are going up proportionally much more than that – Water by 6%, sewer by 7.5%, and solid waste by 8.5%. This reflects the reality that Metro Vancouver is charging us more per cubic metre of water, the sewage plants are charging us more for taking our waste, and tipping fees are going up at the solid waste facilities. For single-family detached homes, this means about $50 more in utilities next year. If you missed the meeting or the Opportunity to be Heard, you can read the Plan here, and yes, you can still comment to Council about it by sending us a note through the contacts on this page. The two Taxi Operators licensed in New Westminster applied to the Province for additional licenses, and although they did not receive as many as they would have liked they each received two new licenses. The law says we need to approve this at Council, and our Bylaw requires that we bring this to the Public for comment. We received no comments, and I have no problem with there being more taxis in the City. The Arts Council of New Westminster has a representative seat on the Arts Commission. In case you haven’t heard, the Council has a new Executive Director, Stephen O’Shea, and he was nominated by the Commission to represent them. I am sure we are going to be talking about this for a while, but City council, The School district, and the Royal Lancers exchanged some correspondence over the last two weeks. I am going to hold back at commenting about this issue until we have had a chance for some discussion between the multiple parties. I had a respectful conversation with one of the Lancers after the Council meeting, and another today (I am writing this on Friday, April 2), and can see that there is potential for agreement or respectful disagreement without calling each other stupid. More to come on this issue, obviously. Two local Good News Beards opened a brewery in town, and I have to admit I have sampled a fair amount of their product. As I mentioned in a previous Ask Pat post, zoning around brew pubs is a bit challenging, as is navigating the various local, provincial, and federal government agencies that have to sign off when you open a new brewery. When setting up, the boys at S&O applied for and received the easiest type of permit for their operation: that of a limited tasting room. However, their success has made it apparent that they are ready to operate as a proper “Lounge”. This will remove some restrictions on how they serve, while putting other restrictions on how they operate. Seeing as they are a real regional success story, they have no real competition in town, and they have not generated any complaints from neighbours, the Police, or the Liquor Inspector since opening, it is easy to support their license change and support their move to be more competitive. The Heritage Home at 223 Queens Ave has an extra-long lot, and wants to subdivide it to build a new home facing the lane behind (which is effectively a road, as it is named Gifford Place). This is not a “Laneway Housing” application, as the proponent wants to subdivide into two separate lots, as opposed to just building a second residence on the same lot. This project will be going to Public Hearing on April 27, 2015. C’mon out and tell us what you think. The owners of Royal City Centre want to change the big signs on their property, by adding more signage to the existing structures. These are not new signs (as I realized after asking what, in hindsight, was a silly question in the Committee of the Whole – my first embarrassing moment of incomprehension on Council – likely not my last) but additions to the existing signs. The required Variance to the Sign Bylaw will be going to Public Hearing on April 27, 2015. C’mon out and tell us what you think. As most skiers know, the snow levels in the interior and the south coast are well below average, so barring an incredibly anomalous melting season, we should not have any flooding risk during this year’s freshet on the Fraser River. Put away your sandbags, folks. Apparently the restored Trapp+Holbrook project (and, presumably, the previous Trapp Block) encroaches over City land. The building is on private land, but the cornices and some of the decorative rockwork actually projects over City land. A Section 219 Covenant assures the City will not be held liable for any damages done to anyone or any entity due to the existence of elevated rock in the City’s airspace. Ugh. Lawyers. The project planning for a Canada Games Pool refurbishment/ replacement is only just beginning. This is a big project, so it is wise if a set of project principles are developed prior to the start of public and stakeholder engagement. Reading through it, Many of the principles are very high-level, reflecting Council’s feeling that all options are on the table right now until a good reason arrives to take them off the table. One edit we made to the draft principles is the idea that the Pool be the centerpiece of a “precinct” of community uses. Some thought (and I agreed) this limited the consultation from considering other delivery options – two smaller pools at opposite ends of the City, for example. Anyhow, not much to report here yet, except that public and stakeholder consultations about what you want in a Pool/Community Centre will be starting soon. This will be the biggest capital project in the City over the next decade, so you might want to pay attention! The RCFM letter formally asks us to endorse their return to Tipperary Park for the 2015 summer season, which we have done. Talking to the Board and Manager of the RCFM over the last few weeks, they have some exciting ideas for the summer and for next winter. A real community-building organization in the City, powered mostly by volunteers, bringing food security, commerce, sustainability, and community service together with a smile! Last winter market is April 22, and first Summer Market is May 21. Support them! Sewerage and Drainage Regulation Bylaw No.7746, 2015 (which saw third reading last week) was Adopted. It is now the Law of the Land. 336 Agnes Street Heritage Revitalization Agreement Bylaw No. 7734, 2015 (the first Dontenwill Hall one) passed Third Reading. 336 Agnes Street Heritage Designation Bylaw No. 7735, 2015 (the second Dontenwill Hall one) passed Third Reading. Bylaw to Limit Plumbing Fixtures in Detached accessory Buildings No. 7743, 2015 passed Third Reading. 223 Queens Avenue Heritage Revitalization Agreement Bylaw No. 7710, 2015 passed First and Second readings, and is off to Public Hearing. 223 Queens Avenue Heritage Designation Bylaw No. 7711, 2015 passed First and Second readings, and is off to Public Hearing. …and that was a night’s work. Posted on April 2, 2015 April 3, 2015 . by Patrick Johnstone. 1 Comment. The City is installing fibre optic infrastructure, and this is a good thing. It is a significant step in the ongoing shift from our old economy of sawmills and manufacturing to the new “knowledge-based” (ahem) economy that will be our future if we choose to establish a balance between employment and living space in New Westminster in the decades to come. The Intelligent City Initiative is more than just fibre in the ground, it is about leveraging the advantages that come with that fibre to build a City ready to receive the future. It is about building the infrastructure the businesses and citizens of tomorrow are going to want/need, and about making that infrastructure accessible. But it isn’t without its challenges. In Part 1 of this blog, I’m going to talk about the fibre. In Part 2, I will talk about some of the bigger ideas around the Intelligent City Initiative. For those who don’t know about the Intelligent City Initiative, it starts with Broadband Connectivity, and the City plans to encourage this by providing open-source fibre-to-the premises of businesses (and eventually residences, I hope) along major corridors, which will provide the opportunity for others to offer Gigabit service to their customers. This does not mean the City is getting into the volatile telecom business in competition with Telus or Shaw. Instead, we are increasing the opportunities for the major telecoms and a myriad of smaller players to provide high speed and specialty internet service to the businesses and residents we want to attract to (and sustain within) New Westminster. This technology and its benefits are hard for some people (even some of those who own the buildings in New Westminster that may benefit) to understand – what is the City’s role going to be? In an attempt to explain this I improvised a rough allegory during a Council meeting when the project was reviewed. I thought I would expand upon that allegory a little better here, with the benefit of long form-writing and hindsight. The factories, sawmills, and warehouses that formed the economic backbone of New Westminster only a few decades ago relied on transportation infrastructure to move the goods they produced. Indeed they located here because the River was that original source of transportation. Before globalization, free trade deals, and the invisible hand smeared most of those manufacturing jobs to various regulation-avoiding far eastern shores, manufacturers needed roads, rails, and the river to move raw materials and manufactured goods. In the new “Knowledge Economy” (ahem), the raw materials and manufactured goods are information. They are lines of code that move at the speed of light, but they still need infrastructure to move, and the better the infrastructure, the more competitive our local businesses will be at adding value to that information. Today, that information is being moved mostly by (allegorical) oxcart or rails. For most of us living and working in New Westminster, the data is moving by oxcart – by copper wires piggy-backed on phone service. This service is reliable and cheap, but slow with limited capacity. It is ok for surfing the net and the occasional NetFlicks binge, but if you are trying to run a 3D animation company and are communicating with head office in Palo Alto, or if you are running web services company with global customers needing access to your server, the oxen can’t carry the load and they move to slow. If you need to move more stuff, you need to get a contract with one of the railways. To continue the allegory, the railways are the major telecoms (Telus, Shaw). Much like the railways of old, they (and only they) can provide lots of capacity, but need to create a business case before they build the spur line to where the heavy lifting is required. When choosing between increasing capacity into existing tech hubs where the customers already are (downtown Vancouver) and building to the tech frontier where they don’t know who is going to show up (New Westminster), their business plan is pretty simple. The alternative for local businesses is to finance the building of their own spur, which can be a difficult investment at the start-up stage, and you are still beholden to the rail company you connect your spur to – you cannot ask for lower bids from the competition without also building them a spur. What New Westminster wants to do is get away from the spurs belonging to the major monopoly players, and build some roads. Highways, actually. Serious onramps to the Al Goreian “Information Superhighway”. We will help our customers build driveways to connect to the road, but mostly our job is to build the road. We are not creating a new major trucking company (the telecoms will provide that service) nor are we supplying trucks. The major telecoms will be able to rent our roads for running trucks to customers in our City – they save the cost of setting up the infrastructure, we get the long-term benefit by having them here. As a bonus, the smaller telecoms (yes they exist) can also use those same roads to provide boutique services to high-tech customers in our City, and can really start to compete with the larger telecoms to push the wholesale cost of these services down, making businesses in our City more competitive in turn. The win-wins pile up pretty quickly. By providing the road (in the form a glass fibre), we encourage the telecoms and service providers to sell a service, and we charge them rent on the infrastructure to support it. Unlike real trucks on roads, these ones move at the speed of light, and you can fit thousands of them on the same road at the same time. It is ridiculous to suggest that capacity is “unlimited”, but the limit on the installed capacity is so high that if we ever get close to exceeding it, we will be making so much money from the rental of the service that upgrades will be easily paid for. Another bonus is that the network hardware (another stretch of the transportation analogy: the intersections, crosswalks, traffic lights, etc.) can be supplied by the telecoms and service providers, and we can change them for using our space to store them. Imagine if trucks driving through New Westminster paid for their own intersection lights, and we charged rent for putting them there! The business case here is solid, so you might wonder why everyone else isn’t doing it. The simple answer is that many of them are, although their models often differ. The New Westminster business plan was developed after careful review of what has happened in other jurisdictions, and what we can learn from them. 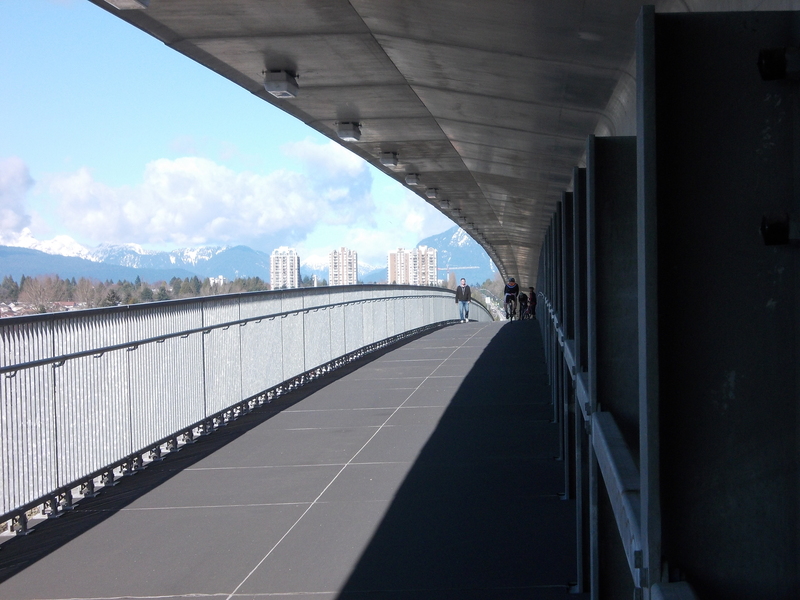 It also leverages some significant advantages New Westminster has over other Cities. We are a compact city of only 15 square kilometres, with high commercial density along major corridors, which means the initial fibre installations can be put near a lot of potential customers for very low cost. We also own our own electrical utility, which provides us both an infrastructure advantage (we own rights-of way, poles and conduits, instead of having to negotiate them from a myriad of partners) and an administrative advantage (we can use the utility expertise and administrative structures in that agency to guide our operation). We also have a backbone of fibre already connecting many City assets (parks and buildings), and have been installing fibre-ready conduits as we upgrade and maintain our roads and sidewalks. It happens we have a few “major tenants” (think educational and health care institutions) whose increasing need to move data would benefit from signing up to this, and we have recently developed, or are looking at developing, a lot of office space on our major corridors that are increasingly becoming attractive to the types of small- and medium-sized high-tech firms that would benefit from having access to this fibre. The investment here is not insignificant, more than $5 Million in initial outlay. However, a conservative business case has this system revenue-positive within 6 years, and paying off the infrastructure investment in about 20 years. There are very good reasons to believe the payback time will be much shorter than this, and the City will begin to see revenue generation from this project within the first half of the long-term 30-year plan. Long after I’m gone from Council, but sometimes you need to plant a tree knowing the shade will be enjoyed by others, to bring another metaphor into the discussion.